Twelve is my favourite number, and also my placing in both races this past weekend! Coincidence? Probably not. 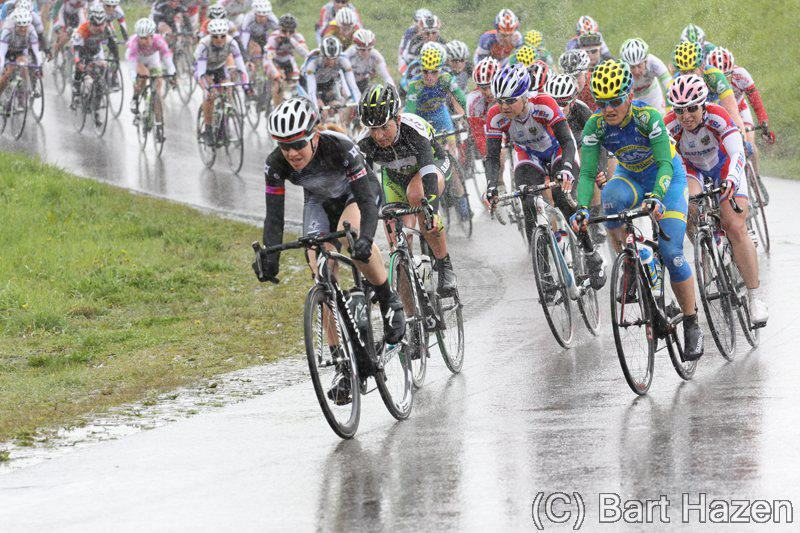 The weekend began with a flat 125 km race in Holland, EPZ Omloop van Borsele. There were 197 girls on the start list. The number of starters doesn’t really faze me anymore. There are 200 crazy aggressive girls chasing each other down roads the size of bike paths? Well I guess I better get in front of them. The weather was playing major tricks this day. The sun was out and shining on the start line, convincing me to shed all warm clothing. No need for long fingered gloves, a headband, rain jacket or leg warmers. Very bad call. An early break gets away every year, so like for every other race here, the had to absolutely be at the front of the race when it split. I rode hard and did make the front group of 25ish, however, I did not expect the group to split yet again! There was a sinking feeling when we came out of a forested area to see a group of 7 speeding away. I reacted and tried to bridge across, but turned onto a windy road and ended up in that awkward, in between two-group stage. A few other attempts did not succeed. After the first lap, the next group containing a few more teammates caught back on. It was also at this point that the heaven’s decided to open up and completely soak the peloton. I was instantly soaked to the bone. The corners became very slick and there were more crashes. The rain combined with a vicious crosswind made it one of the coldest experiences ever on the bike. The loss of the use of hands made the action of reaching to my back pocket for food next to impossible. I shudder to think what sorts of strange bacteria I picked up from all the water coming off the road straight into my mouth. A flat tire sent me back to the car; apparently our mechanic had a hard time changing the wheel because I was shaking so bad while trying to hold up my bike! At least the effort to get back on had some warming effects. I’m confident riding in miserable weather, but days like these are a serious mental test. You go through stages of wanting to quit so bad, but also wanting to finish from making it so far along. Thinking about the misery and counting kilometers just makes it worse, and distracts from the race itself. Rhae laughed when I told her to think of hot things. Laughter helps when you really just want to cry. Coming to the finish I could hardly see anything from the rain. Joanie did a great job helping me stay near the front coming in for the sprint. It was pretty sketchy coming down the final straight, but I stayed upright and took 5th in the bunch behind the breakaway of 7.The race was won by Ellen van Dijk of Lululemon from the break. I have never been so happy to finish a race. I started to feel normal again after getting dressed in copious amounts of clothing and eating an entire can of rice pudding. Unfortunately you don’t get to choose the weather in bike racing. Joanie did point out that it is days like this that make you tough! Photo credit: Bart Hazen. Clara on the front, me in the background shielding my face from the water. Check back tomorrow for Part 2 of the weekend adventures, racing the GP Stad Roeselare. Thoroughly enjoyed reading your account of the race and nice work to earn a great finishing position! I'm amazed at how you were able to acheive a fantastic finish despite the horrendous weather and getting a flat! Thanks! I think I'm in even more determined to do well in races with terrible conditions. Thanks Opa! It was quite the race!